Private jets are more than just a way for business executives to get from one meeting to the next. They’re a gateway to opportunities for education, philanthropy, and a much-deserved getaway. With the ability of private jets to reach remote locations on a custom schedule, they’re also the go-to for adventure — which is why one tourism company is turning to private aviation for a mind-blowing, around-the-world safari tour. 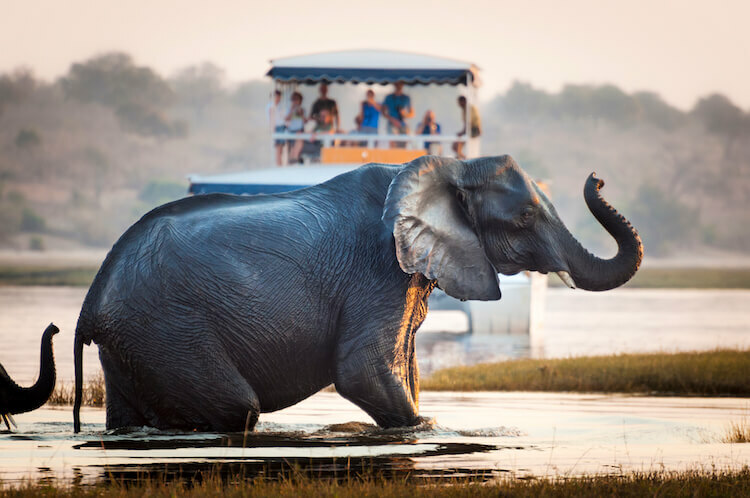 The world-class travel pros at Abercrombie & Kent have created a month-long wildlife safari tour that relies on a private jet to take 50 lucky explorers to stops across the globe to witness the wonders of nature firsthand. If you’re fortunate enough to count yourself among the passengers of this safari tour, a private jet will take you to safari hotspots across Asia and Africa; including Japan, China, the Philippines, Malaysia, India, Rwanda, Madagascar, and Kenya. At night you can enjoy some R&R in top-of-the-line accommodations like The Temple House in Chengdu, China and the Oberoi Vanyavilas in Ranthambore, India. And of course, you’ll be able to cross plenty of exotic animal species off your must-see bucket list — 15 exotic species, to be exact. 8 countries across Asia and Africa, all in 25 days. Read on to learn all about the private jet tour that makes this dream trip a reality. You’ll encounter rare and iconic species on this wildlife tour, including giant pandas in China, orangutans in Malaysia, tigers in India, and gorillas, lions, elephants, and rhinos in Rwanda. You’ll also see some lesser-known but equally fascinating critters of land and sea. You’ll come face to face with snow monkeys in Japan and tarsiers in the Philippines. And while you’re in that part of the world, you’ll have the chance to swim alongside massive whale sharks (don’t worry, they’re harmless). Golden monkeys, honey bears and lemurs are among some of the other species you can expect to witness on your adventure. You wouldn’t pay the hefty price tag for a spot on this once-in-a-lifetime safari tour if you didn’t love nature. But Abercrombie & Kent makes every dollar worth it with an itinerary that goes beyond monkeys and lions. In addition to world-class local cuisine and hotels (including this stunning retreat in the Rwandan countryside), this tour gives you the ability to design your days in between safari tours. In Japan, choose between champagne under cherry trees or tours of the country’s most sacred Buddhist temples. Golf in the Philippines and enjoy a river cruise in Malaysia. Explore local villages and forts in India, and hike to a volcano in Rwanda — the list goes on and on. From the highly-customized schedule to landing in remote areas, a tour like this just wouldn’t be possible without a private jet. A private jet flies on its own schedule, and allows passengers to skip security lines. On a safari trip like this, that means that you get to make the most of your time. Imagine after a day of playing with lemurs, you take in the sunset in Madagascar, engulfed in the fragrance of wild ylang-ylang flowers, a cocktail in hand. You wake up the next morning and are whisked away to your private jet, which is ready to go as soon as you board. By that same afternoon, you’re in Kenya getting prepped to pounce on sightings of lions, rhinos, elephants, and more. The jet that makes this tour possible is outfitted with custom first-class seats of Italian leather with a built-in massage system. The seats can be folded back to lie flat, so passengers can get caught up on sleep between locations — plus, each seat comes with noise-canceling headphones. The plane is staffed by a dedicated crew that knows how to make you feel at home — whether it’s by mixing a cocktail, whipping up a specialty coffee, or preparing a meal that’ll make you question everything you thought you knew about airplane food (an onboard Executive Chef helps see to that). Abercrombie & Kent has also mastered the finer logistics of traveling in style by providing bell boy and valet services to transport your luggage from jet to hotel and back, as well as manage everyday needs like laundry. A private jet doesn’t have to be reserved for epic planet-spanning journeys. It might also be perfect for all your travel needs, from the everyday business trip to your next family outing. Whether you’re traveling for business or pleasure, there are a number of reasons why it might be time for you to make the jump from first class to private charter jets.